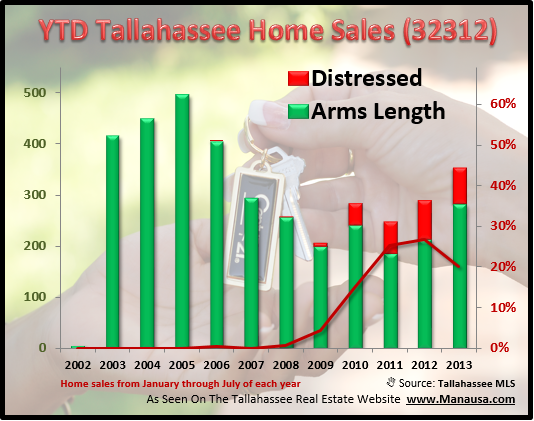 Real estate in the 32312 zip code represents the top of the Tallahassee real estate market in terms of home prices and values. With more than 50% of the home sales in Tallahassee coming from the NE Quadrant, the 32312 zip code enjoys newer schools (like Chiles High School), great golf courses, and a lot of the amenities that are sought by wealthier residents. So I figured it was time to provide an update on real estate in the 32312 zip code to see how this market-leading area is performing. The number of short sales, foreclosures, and bank owned properties being sold in the 32312 zip code is on the decline. This is good news if it continues. Roughly 1 in every 5 homes sold this year has been a distressed property. We study these graphs to determine as much information as we can about the housing market. 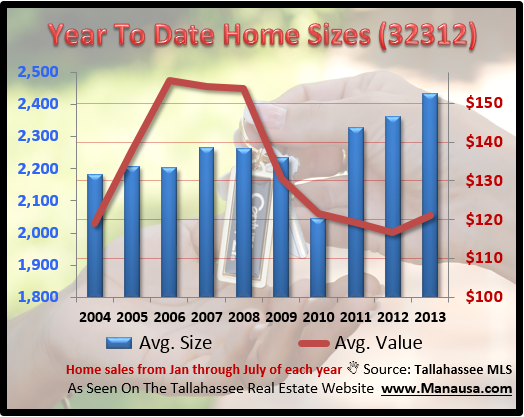 This real estate graph below provides an important insight into home buyer behavior. Each of the blue bars in the graph below measures the average size of a home sold in the 32312 zip code from January through July of each year. This year is yet another record setting year for the average square footage of homes sold in the 32312 zip code, meaning buyers are favoring "big" over everything else. I think it is a sign that buyers think size of home is one of the most important elements of value, and a lot of the amenities that were added during the boom of the market have less value today (think granite and stainless steel). Apparently, "bling" is no longer valued by today's buyers. 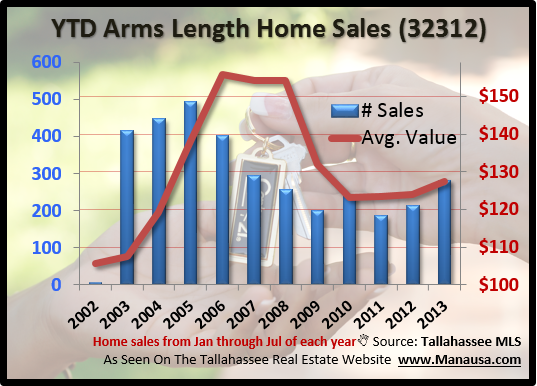 When we drop all the distressed home sales in the 32312 zip code, we get a view of arms length sales. Arms length home sales through July in the 32312 zip code are more robust than any year in the past six, and average values are on the rise. With roughly 5% appreciation being recorded on average, you can bet the middle price ranges are doing the majority of the appreciation while the luxury homes in the 32312 zip code continue to deal with too much supply. Now is a good time to be putting a home up for sale in the 32312 zip code. For many price ranges, values are on the rise, and educated home buyers know that interest rates are rising and they need to hurry to lock in to historically low interest rates. If you are thinking about selling a home in the 32312 zip code, just drop me a note and we can help you determine your best asking price to get top dollar for your home. Thanks for all the information, it's appreciated! A significant down payment was not needed with the loan products of 2002-2007, and considering that people selling are not pulling out equity like they were in the past ... where will these newly required down payments come from?